Speeding down the road from Les 2 Alpes, I unzipped my jacket as the sun’s warming fingers crept around the vertiginous peaks standing sentry on either side. 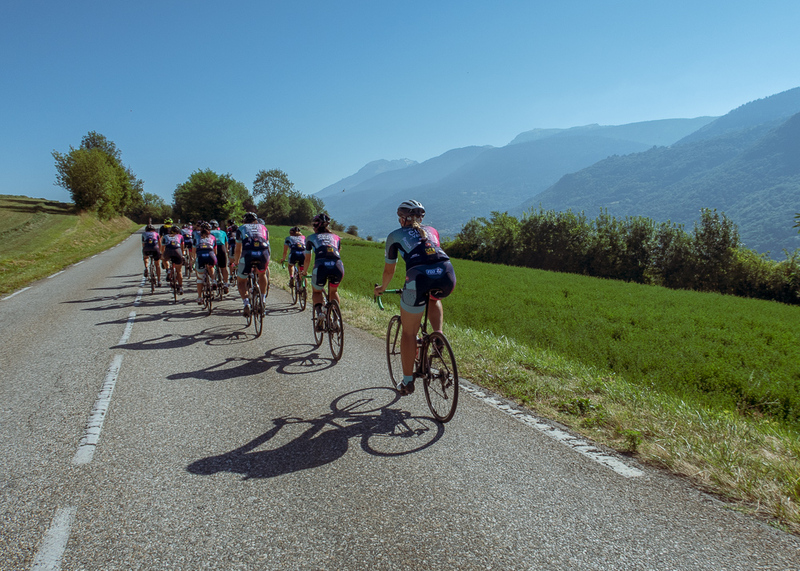 I was on my way to meet Donnons des Elles au Velo J-1, a formidable sounding group of 13 women who were riding every stage of the Tour de France the day before the men competed in the world biggest and greatest bicycle race. My jacket flapping in the wind, sleepy legs slowly waking, a series of questions ran through my mind. Did I have enough TRIBE bars to keep myself fuelled over the next day? Would we be able to stop for water? Had I remembered my sunscreen? Just how fast were these women going to ride? I rolled into our meeting spot on the side of the road just outside Bourg d’Oisans feeling very much like the new girl at school, unsure who I should speak to and where I’d fit into everything. Spotting a support car filled with water I felt reassured that I wouldn’t die of dehydration (it was due to be hotter than the sahara), so I spent some time slathering myself in Factor 50 whilst I attempted to decipher the meaning of the team briefing taking place in uber-fast French. We rolled out. We were riding Stage 13 of the Tour de France, a 170km epic from Bourg d’Oisans in the Isère to the city of Valence in the Auvergne-Rhône-Alpes. 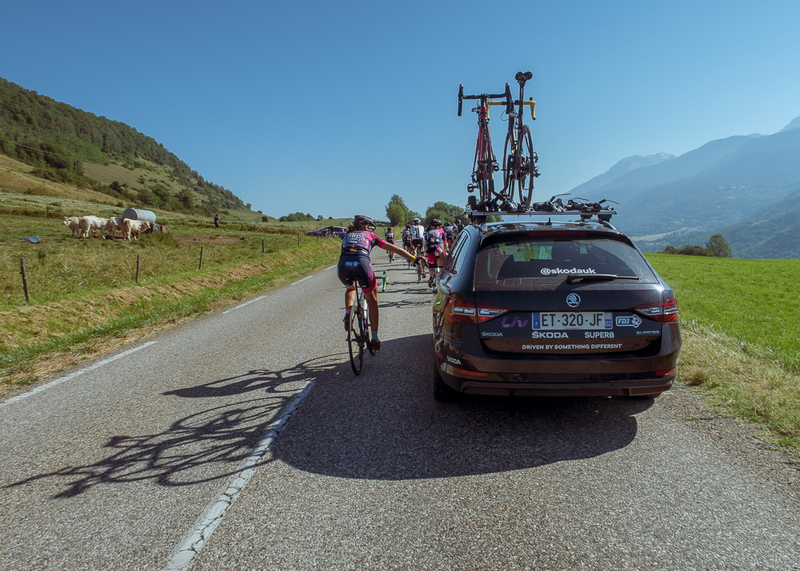 After a particularly punishing Stage 12 in the mountains, the weary band of women were happy that the day’s stage would be very flat and had been instructed by their coach to use the day as a recovery ride. He’d made it emphatically clear that under no circumstances were we to push hard, break away or do anything except roll, putting the minimal amount of force through our pedals so that the team could flush the lactate from their legs and give their muscles a chance to repair. You might think that as I bike racer I’d find these instructions hard to follow and want to push hard. Wrong! Though I do adore going fast, a day in the saddle with no ‘efforts,’ intervals, puffing, panting and leg pain sounded pretty delightful so I settled into a cruisy pace with my companions and set about getting to know more about them and their mission. The whole point of the ride (although not the only reason – the 13 women simply enjoy the opportunity to do nothing but ride several weeks each July) is to publicise the fact women are denied a Tour de France of their own, and frequently because people think that women aren’t strong enough to ride a stage race of such length and difficulty. As all of the women in Donnons des Elles au Velo J-1 are amateurs (some of them racers, some of them not), in matching every mile the men ride each year they make the point that women are more than capable of riding back to back stages of significant difficulty. So whilst Donnons des Elles Au Velo J-1 aren’t actually racing, but rather riding, the point is a professional women’s UCI team could perfectly well race a women’s Tour de France if they had the opportunity. The point of the ride is not, as some silly commenters have written on my video, to get women to ride in the current Tour de France alongside the men. In what other sport do men compete alongside women? The idea is to publicise the need for parity and the fact that women aren’t given the chance to shine and ride the biggest cycling event on the calendar. Imagine if Wimbledon was just for men? Imagine if you grew up knowing the you’d never be able to ride the Tour de France just because you were born female – what does that say to girls? 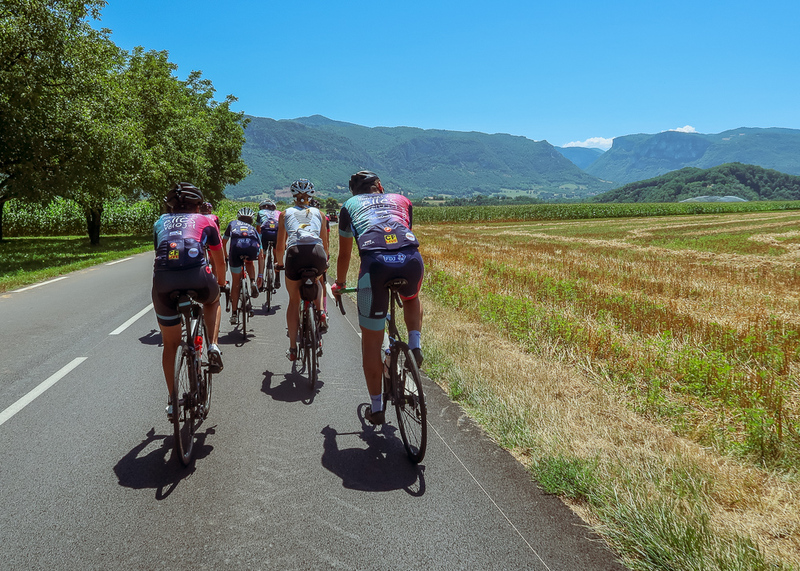 As we continued to roll along the valley, a neat peloton of smiles and tanned limbs I cautiously began to practice my French and was happy that I seemed for the most part to be understood. It was pretty crazy to be riding on such a flat road slap bang in the middle of the French Alpes and even at ‘recovery pace’ we began eating up the miles. Every time someone got a little overexcited and went too fast, a cry of ‘oop, oop!’ would be heard from a sensible member of our group reminding us to take it easy and rest our legs. About 30km in, we reached our first hill, something I found really strange as I can easily climb 1000m in 30km back home in Devon, and we were in the Alpes! We pedalled to the top for a gorgeous view of the mountains, pastures in the foreground making for quite the idyllic scene. Ditching jackets and grabbing bidons from the support car, we descended through pretty villages before resuming our ride on the flat. And in this way it continued for several pleasant hours. 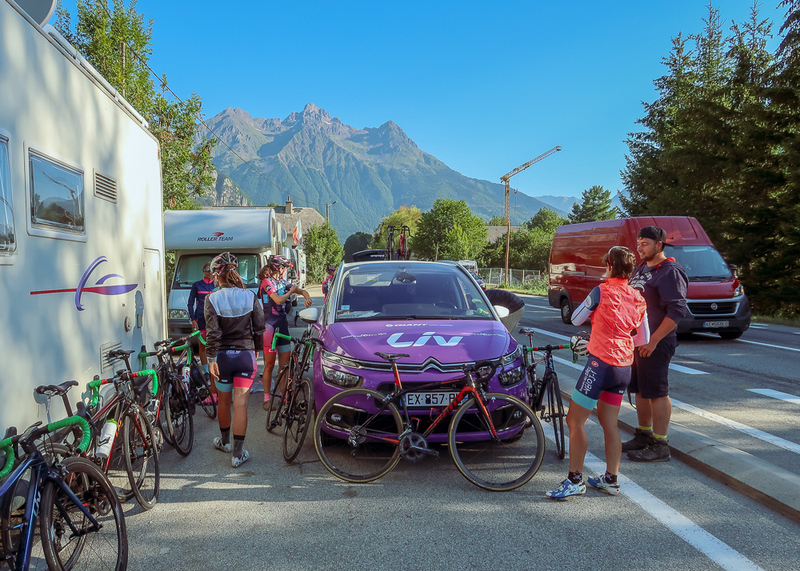 A big thanks to ŠKODA for sending me to coverage the women’s ride and for sponsoring Donnons des Elles Au Velos J-1 this year. If you’d like to find out more about Donnons des Elles Au Velos and their mission and find out how to join them for a stage of the ride yourself, check out their Facebook page here. .Previously Ride For Love in the Sierra Nevada – Join Me!